Flannel grey pinstripe - Dormeuil British Collection. 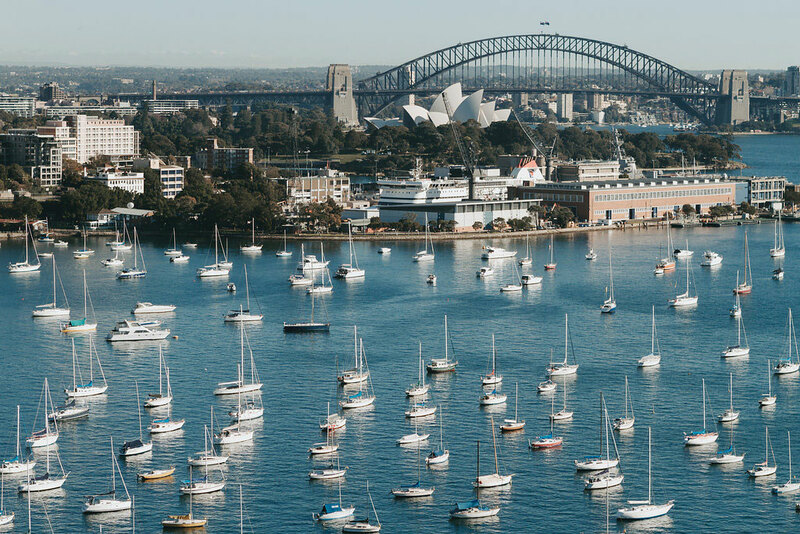 Chris Gray welcomes you into his home, opening the front door to reveal an epic view behind him - a 360 degree spanning Sydney’s harbour. Chris is charismatic and immediately puts you at ease, giving you a moment to take in the view. 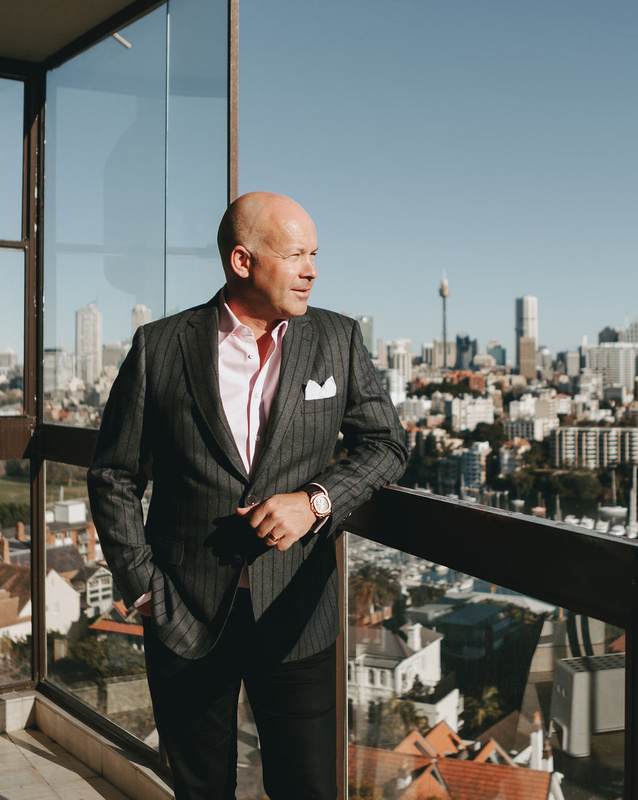 It’s not surprising his home is impressive - as the host of 'Your Property Empire' on Sky News Business Channel, the Financial Judge on Channel Ten's 'The Renovators', CEO of Empire property consultancy, and having published two books, Chris has an innate understanding of Australian real estate. His personal style is confident and fresh; mixing pops of modern pink with classic pinstripes, pairing luxurious English fabrics with soft denim. 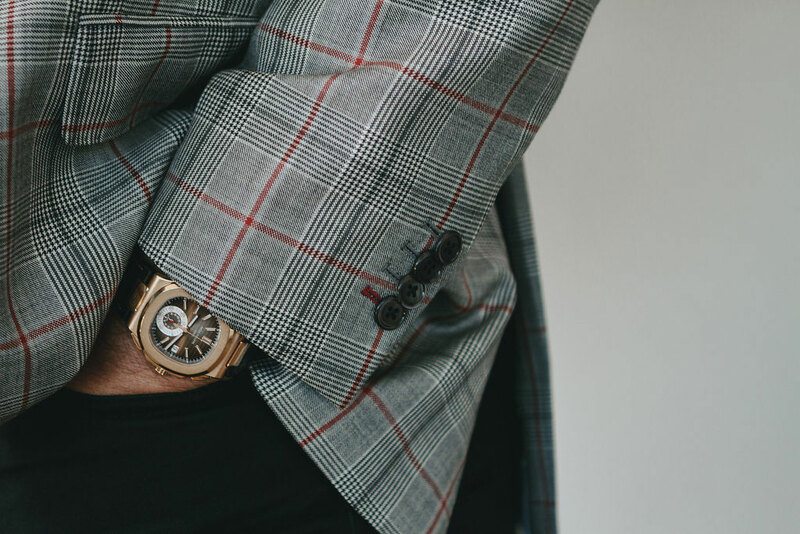 His accessories are refined and luxurious - a simple silk pocket square and classic gold watch. OH: You’ve established yourself as an expert in Australia’s property market, and for doing it with style. Tell us a bit about what you do. CG: Yes I was the only one in a suit, tie and pocket square on the building site on Channel Ten’s ‘The Renovators’ back in 2010 - everyone else were real life tradies and renovators that actually got their hands dirty! I’m still hosting Your Property Empire on Sky News Business which I’ve been doing for about 8 years, although I haven’t worn a tie in years on the show. OH: Tell us about Empire and how it came about. CG: I started investing in property at the age of 22 while I was training to become an accountant. I turned $35k into a $3.5m portfolio in just 9 years and semi-retired from Deloitte at 31. My friends and colleagues started asking me how I did it and how I had the money to live on the beach, drive fast cars and travel overseas. So I started coaching and mentoring them. A CEO back then told me he would rather pay me to do it all for him and that’s when the buyers agency was born. We now give away all the information for free in my book ‘The Effortless Empire. The time-poor professional's guide to building wealth from property’ and then we help those that want to outsource to the experts and want me to do it for them. CG: One of my first jobs was as an accountant for Kodak Finance in the era of TQM = Total Quality Management. It taught me about the need for attention to detail, accuracy and doing what you say you’re going to do, when you promised to do it. That’s very important in my current business as real estate doesn’t always have the best reputation. All our team are focussed on being honest, ethical, looking out for the customers best interests and always doing what we promise. OH: Tell us about when you decided to get into real estate? CG: I initially bought my first home because my mum gave me a midnight curfew and I wanted to stay out and have more fun with my friends. I only earnt GBP10k which meant I could only afford a horrible one bedroom unit in the worst part of town! - Be honest, ethical and do to others as you would do to yourself – your reputation is everything. - Buy as much blue chip property as you can, as early as you can, as it will often earn more than you can ever do through employment and it leverages your time and money. - Live for today, whilst putting some away for the future. So many people have health issues and many regret not doing things when they look back at their younger years. So live today like it could be your last. CG: I bought it from a fairly upmarket shop in London as my dad was a doctor and they gave medical professionals a discount, so that’s where he got all his suits from. They also had a sale on. It was a blue suit with a fairly subtle pinstripe, however 3 months later I wore through the seat of the pants. I don’t know what they thought I was doing in it, as I was only sitting down being an accountant, but luckily they did end up replacing the pants and the next set did last me a few years longer. OH: How has your style evolved since then? CG: I gave up everything English when I emigrated to Australia 20 years ago. The only heritage I’ve kept is the bold English pinstripe. I’ve never been a shrinking violet and have always been happy standing out in the crowd and so I like something different. Light grey check - Dormeuil Amadeus 365 60th Anniversary Collection. OH: What do you think is important to consider when getting a suit made? CG: You’ve got to find a tailor that understands the image that you’re trying to portray so they can help and guide you through fabrics and styles. I’m good with numbers and figures, but I’ve got no idea when it comes to styles, cloth, colours etc - so I prefer to buy on a high price point, rather than actually knowing whether it’s real quality. 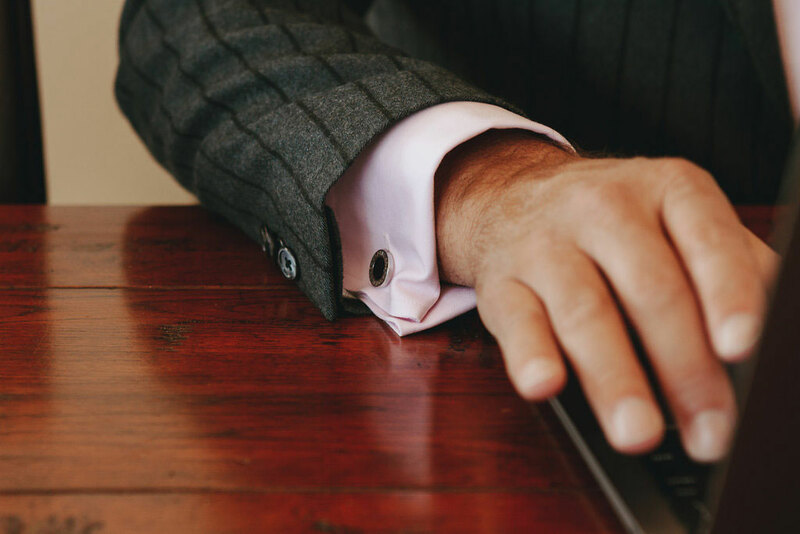 I could never risk a client thinking I wore cheap suits – it would make it incongruent with my brand and they may question what other things about me or my business may not be as they first appear. OH: What accomplishments are you most proud of? Buying my first home at 22 – even though I moved in with a $200 ikea futon and a warm case of beers as I had no fridge. Poms do still drink warm beers over there I think. Retiring from a full time job at 31 – sending that email to all my contacts saying that I was giving up work and not on email anymore was the best email I ever sent – my Dad was on the phone straight away asking what I was doing and to get back to work! Getting my first gig on TV and then getting my show on Sky Business – I’m still terrified of public speaking even though I’ve done about 400 shows. They say your biggest fears turn into your biggest passions so maybe one day I will be 100% comfortable. Finding someone that actually wanted to spend the rest of their life with me and giving me 2 great kids. My proudest accomplishment though is that I’m happy. Whilst I do have a lot of material things, I think you’ve got to be happy with who you are and what other people think of you in the community and society. I spend a lot of time educating and helping others, often for free and I like that I don’t need or have to charge everyone. The ultimate pleasure is when someone comes up to me and says something like “I read your book or heard you speak a few years ago and since then I’ve bought x properties” and that it’s had an impact on their life.